Brett Morgan owes his career in auto sales to the fact that his father was restless in retirement. In 2004, Morgan had a radio-programming job in Virginia when his father offered him a different path. Larry Morgan had sold his Tires Plus chain of 600 stores a few years earlier but decided he wanted back in the auto industry. "He just called me up one day and said, 'Have you ever thought about selling cars?'" Brett Morgan says. 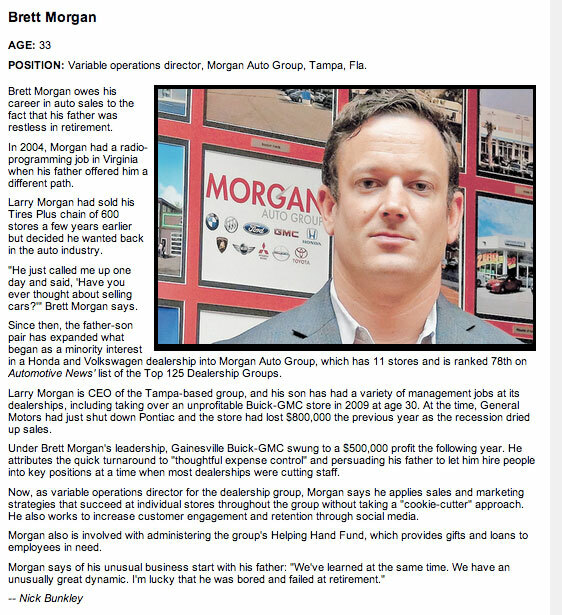 Since then, the father-son pair has expanded what began as a minority interest in a Honda and Volkswagen dealership into Morgan Auto Group, which has 11 stores and is ranked 78th onAutomotive News' list of the Top 125 Dealership Groups. Larry Morgan is CEO of the Tampa-based group, and his son has had a variety of management jobs at its dealerships, including taking over an unprofitable Buick-GMC store in 2009 at age 30. At the time, General Motors had just shut down Pontiac and the store had lost $800,000 the previous year as the recession dried up sales. Under Brett Morgan's leadership, Gainesville Buick-GMC swung to a $500,000 profit the following year. He attributes the quick turnaround to "thoughtful expense control" and persuading his father to let him hire people into key positions at a time when most dealerships were cutting staff. 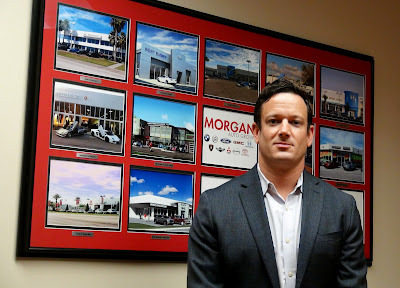 Now, as variable operations director for the dealership group, Morgan says he applies sales and marketing strategies that succeed at individual stores throughout the group without taking a "cookie-cutter" approach. He also works to increase customer engagement and retention through social media. Morgan also is involved with administering the group's Helping Hand Fund, which provides gifts and loans to employees in need. Morgan says of his unusual business start with his father: "We've learned at the same time. We have an unusually great dynamic. I'm lucky that he was bored and failed at retirement."